Maarten Steinbuch. Photo: Bart van Overbeeke. 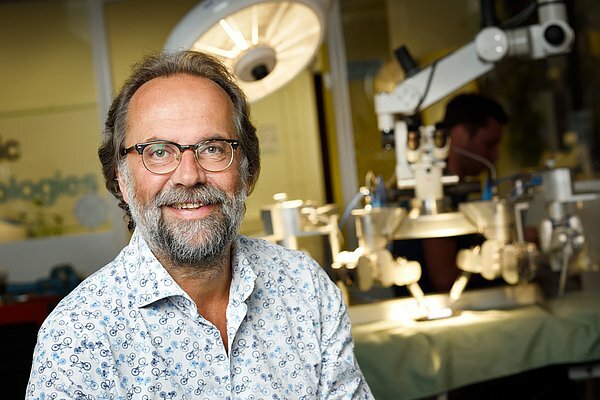 Professor Maarten Steinbuch will be the Simon Stevin Master this year, the highest distinction for technical sciences in the Netherlands. It is an honorary title, bestowed by the STW Technology Foundation, and it comes with half a million euros to spend on research. To celebrate 35 years of STW, this year there are two winners. Apart from Steinbuch, Suzanne Hulscher of the University of Twente is a recipient of the award. Today STW announced the winners, citing that the awards are being given for their technical-scientific research and the way they bridge science and practice. The laureates will receive their awards during the STW annual conference on 24 November 2016. Maarten Steinbuch is professor of Control Systems Technology at TU/e and the work that he and his group do in the field of advanced motion control – the control of advanced engineering systems where extreme precision and speed are crucial – enjoys a considerable international reputation. Examples of this field include machines that produce micro-electronics and nuclear fusion reactors. His group also develops sophisticated surgical robots that are now getting to market via spin-off companies. STW praises the way that Steinbuch creates a bridge between science and industry, and their cooperation in solving societal challenges. In his research, Steinbuch works with leading companies like ASML, Philips, TNO and Océ as well as with many SME’s. It is due in part to Steinbuch that the Netherlands has become a hotspot for developments centering on electric driving, precision systems control and microsurgery. In view of his services as a professor, in 2013 TU/e gave Steinbuch the honorary title of Distinguished Professor. He is also scientific director of the TU/e High Tech Systems Center and of the 3TU High Tech Systems Research Center as well as a member of the AutomotiveNL sector organization. The general public knows him through his many media appearances. STW has awarded the Simon Stevin Master since 1998. Previous are Philip de Goey (2010), Jaap Schouten (2006) and Arthur van Roermund (2004). Simon Stevin (1548–1620) was a Flemish mathematician, physicist and military engineer. He was active in a great many areas of science and engineering.